WARSAW, Poland (CNS) — As preparations get underway for this year’s 100th anniversary of the Russian Revolution, the country’s small Catholic Church is keeping a low profile. However, because some Russian Catholics support the policies of President Vladimir Putin, the church is looking to remain neutral and focus on prayer services and discussions of the church’s history of the last century. “Although we won’t be commemorating the revolution, our church communities will naturally reflect on what happened,” said Msgr. Igor Kovalevsky, secretary-general of the Russian bishops’ conference. “We’ll pray for Russia, and for all those who died for their faith during those dreadful years. But the Catholic faithful hold various political views, so the church won’t try to promote any one position,” he said. 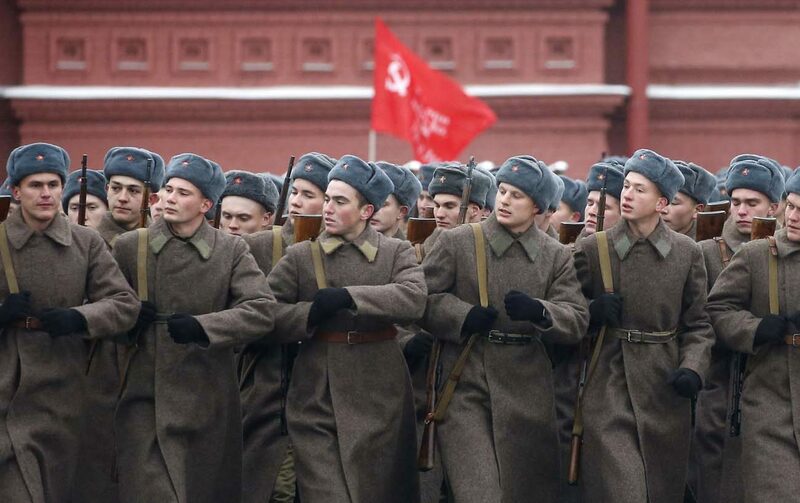 Russia’s observance will include the 1917 overthrow of Czar Nicholas II, which occurred in March under the country’s modern calendar, and the seizure of power by Bolsheviks under Vladimir Lenin the following November, which ended hopes of democratic rule. In early January, Putin appointed a governmental commission for preparations. Russia’s predominant Orthodox Church, which is represented on the commission, debated the centenary during a late-January symposium. That will be the Catholic approach as well, said Msgr. Sergei Timashov, vicar general of the Moscow Archdiocese. “While there are Catholics who join anti-government protests today, we also have parishioners in the riot police preventing them. As pastors, we have to be open to all sides, including those who may see the revolution as an instance in which God brought something good out of terrible deeds,” the priest said. At least 21 million people are believed to have died in purges, acts of repression and “terror famines” after the revolution. Among those who died were 100,000 Orthodox priests, monks and nuns, according to Russian government data. Tens of thousands of Muslims, Buddhists, Jews and non-Orthodox Christians also were killed. Russian and Polish studies indicate that 422 Catholic priests were executed, murdered or tortured to death, along with 962 monks, nuns and laypeople. All but two of the Catholic Church’s 1,240 places of worship were forcibly turned into shops, warehouses, farm buildings and public restrooms. Catholic communities today continue to seek the return of seized churches. Viktor Khroul, a Catholic and a professor of journalism at Moscow State University, said ordinary Catholics remain interested in obtaining the truth. He claimed to know several devout Catholics, including a member of the State Duma, who enthusiastically back Putin, but would never seek to justify a totalitarian system that clearly conflicted with Catholic teaching. “Some Catholics are certainly nostalgic about aspects of the past, believing Soviet education and medical care were much better than what we have now,” Khroul said. “But I’ve never met a Catholic who spoke in favor of persecuting clergy and closing churches, and this centenary will be a good opportunity to refocus memories,” he said. Khroul agreed, saying the revolution is seen today as a turning point in world history, but it’s also an event from which to learn.